Did Jeb Bush just commit a War Crime in Justifying the Iraq War? Jeb Bush’s people are trying to walk back his disastrous interview with Megyn Kelly in which he said that even if he knew then what we all know now, he would have launched the war on Iraq in 2003. It is true that he doesn’t seem to have been very clear-headed in his answer. He blamed “the intelligence” for what he said was a consensus of himself and Hilary Clinton. But the question was not, would you have trusted intelligence agencies all over again, but rather would you still do it knowing what we know now. He said he would, even now. We know now (actually we knew then) that there was no connection between Iraq and al-Qaeda or the attacks of September 11, 2001, and that Iraq had no nuclear weapons program. 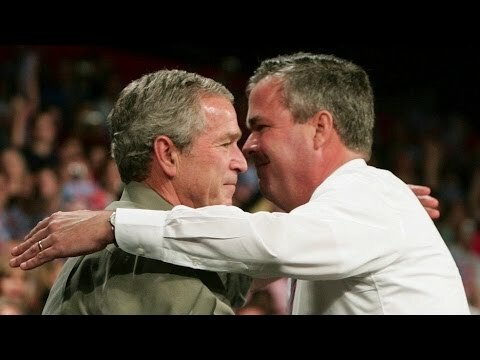 But even before 9/11, in 1998, Jeb Bush signed the letter of the so-called “Project for a new American Century” trying to pressure Bill Clinton into an attack on Iraq. The signatories mostly came to power under W. and more or less made a coup. The problem with his blaming “the intelligence” is that his brother, George W., actively disregarded or even dictated the intelligence. That is why he sourced the phony allegation that Saddam Hussain’s Iraq received uranium from the central African country of Niger to “British intelligence” in his 2002 State of the Union address. The CIA saw the same document and thought it was a forgery, and wouldn’t sign off on including it in a State of the Union speech. Moreover, the “intelligence” was being fixed around the policy, as the British head of MI-6, Sir Richard Dearlove, was disturbed to discover on a visit to Washington in summer of 2002. As Lord Goldsmith tried to tell then British Prime Minister Tony Blair (who hid Goldstone’s cautions from his own cabinet), there are only three justifications for war in post-1945 international law. The first is self-defense, but Saddam Hussein had not attacked the United States. In fact, in the 1980s Saddam launched an illegal war of aggression on Iran, using chemical weapons, and the Reagan administration actively helped him pursue that war, as well as running interference for his chemical weapons use at the UN Security Council. So not only had Saddam not attacked the US but he had been a de facto US ally. The second ground might be a humanitarian intervention under, e.g., the Genocide Convention. This one is controversial but has gained some momentum from the Rome Statute ratified in 2002 and establishing the International Criminal Court. But Iraq was not committing genocide in 2002, whatever had happened in earlier decades. The third possibility was for the UN Security Council to designate a country a danger to international order, and to ask member states to implement a collective security action against it. (These were the grounds for the Gulf War of 1991, the Afghanistan War of 2001 and the Libya no-fly zone of 2011). Bush and Blair never got a UNSC resolution for a war on Iraq, despite pressure on the then members, and spying on them in New York in search of dirt that could be used to blackmail them. The two even tried to think up ways of getting Iraq to shoot down a UN plane, under a false flag, as a way of stampeding the UNSC into a war authorization, as a leaked memo showed. Jeb Bush and many other politicians routinely speak in this frankly fascist manner. What does it mean when they say they want to attack Iran or keep “all options on the table”? They mean that one of the options they want to keep on the table is a hitlerian invasion of some other hapless country, the equivalent of Poland in 1939. Iran also has not attacked the United States; and there is no UNSC authorization for the use of military force against Iran for any reason, including genocide. The great tragedy that there was no trial for anyone guilty of war crimes or crimes against humanity in the Bush administration is that this lawless and fascistic tradition of discourse can continue glibly on. As with Jeb Bush, saying he’d do it all over again.